Is Local Lotto a Scam or Legit? Read Reviews! Don’t you love these cute little lotteries that support local causes? Take Daventry District Council and their online lottery game. This is a homegrown lottery that uses the Australian National Lottery Super 66 game results each Saturday (Aussie time) for their winning numbers. They use 50% of the ticket price to support a bunch of local causes. You’re not going to win a mega jackpot here, at the same time it’s a bit of fun for a nice prize. Players choose 6 numbers from 1 to 9. The idea is to get them in the correct order. There are five levels of prize tiers. If you get all six numbers in the correct order the jackpot is £25,000 down to £5 for getting 2 numbers correct. Okay, Local Lotto should go into their terms and conditions and change the 2 number prize of 3 free tickets. Or maybe they change the £5. Tickets lines cost £1. Winning numbers are published on local-lotto-co.uk’s web site. Keep in mind the time difference as the basis of the numbers is a game played in Australia. Winners are told they won by email and put on their website. There is no information on quickly winners get their cash. This cute little game is only for residents of Great Britain and for players 16 years and older. Oh – and you can’t get tickets or get prizes for someone else. Okay, so their terms and conditions could be a bit more extensive in including more information on what happens when you win, how you get your money. Then again, this is a lottery to fundraise for local causes. There is also separate terms and conditions if you have a local cause that wants to jump on the bandwagon. The Daventry District Council has partnered with Gatherwell to offer this weekly lottery. They are registered with the UK Gambling Commission. There is a snail mail, email address, and telephone number. Their offices are open 9:00 am to 5:30 pm GMT Monday to Friday excluding Bank Holidays. They are also linked to Facebook and Twitter. 50% of all winnings go to local causes. 40% goes to the charity you want and 10% to “other good causes”. 30% goes to the prizes local-lotto.co.uk offers. 20% is for administration. For your 40%, you get to choose where you want it to go. The list is pretty extensive including the Daventry Browns to West Haddon & Guilsborough Cricket Club. There is also the option of simply choosing the central fund. 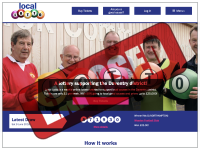 Would you mind rating Local-lotto.co.uk? If you’re a resident of Great Britain and like to support local causes and like to play lotteries, this could be a good bit of fun – and you might win some money. You’re not going to win one of those mega jackpots but the price of the tickets makes it a nice little game. This site gets a thumb’s up – if you live in Great Britain. It’s a nice combo of playing a lottery and giving to good causes. Played for a little while seemed more useless than trying regular lottery plus had to pay for entire month so no off ticket. Also contacted customer services was not impressed. Don’t bother playing most you probably get is free tickets, recommend if you want to support local causes just donate directly to them.